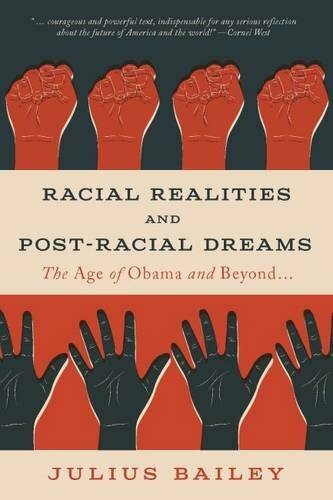 Article first published as Interview: Julius Bailey, PhD – Author of ‘Racial Realities and Post-Racial Dreams: The Age of Obama and Beyond on Blogcritics. Julius Bailey, Ph.D., Christian Existentialist, teaches in the Department of Philosophy at Wittenberg University. He is a philosopher, cultural critic, social theorist, and diversity lecturer. As a socially conscious academic, Dr. Bailey has been interviewed on CNN, Fox, B.E.T, and ABC Nightline. A guest on numerous radio shows as a social critic and education advisor, he is often sought to speak at colleges, prisons, and community organizations across America. Recent publications include The Cultural Impact of Kanye West (ed. Palgrave-McMillan, March 2014), Philosophy and Hip-Hop: Ruminations on Hip-Hop as Postmodern Cultural Form (Palgrave,-McMillan, July 2014) and Jay-Z: Essays on Hip Hop’s Philosopher King (McFarland, 2011). He has also authored a host of articles on Hip-Hop Pedagogy and Social Justice issues. He holds Masters Degrees from Howard and Harvard Universities, and a Doctorate from the University of Illinois. Sheri: Welcome, Dr. Bailey, and thank you for being with us today. Why don’t you start by telling our readers a bit about yourself? Dr. Bailey: Well thank you, Sheri! I am complex, yet simple. As a philosopher, I tend to see the world through a very rational lens. That is to say, I try, at most times, to be logical about the ways and doings of the world. As you can imagine, this gets me in trouble given that people are generally more feelings/emotively based than objective and rational. So I often must take off my philosophical hat and just live! I am a proud father of a 9-year-old daughter who shows up in the Introduction of this book. I teach at a wonderful Ohio Liberal Arts University named Wittenberg. I am on Sabbatical in a matter of days and I am so excited for the time off. Though I have written about Hip Hop, Blues and Gospel are my favorite musical genres. Sheri: What is Racial Realities and Post-Racial Dreams: The Age of Obama and Beyond all about? Dr. Bailey: I have penned it my love story with America. This project was birthed as a Confession of love to an America that often fails to love me in a symmetrical way. Such a revelation is bound to create tension as I uphold the tenets of the Cross at Calvary, yes I am a Christian while also waving the flag of civic patriotism that seems to trump our nation’s moral compass. Sheri: What was your inspiration for writing Racial Realities and Post-Racial Dreams? 1) Wanting to lead what will most assuredly be a plethora of Obama-based books; 2) thinking about this (often) unrequited love saga I have with the doings of America as I mentioned already; and 3) being emotionally charged, yet rationally dismayed by America’s perception of the small pockets of violence for violence sake during the tension-led uprisings following the deaths of Mike Brown (Ferguson, Missouri), John Crawford (Beavercreek Ohio Walmart), Eric Garner (New York) and Freddie Gray (Baltimore). Young people in each of these communities flocked to the streets to vent their frustrations—sometimes, much to the chagrin of older civil rights icons—in violent ways. But I was also inspired by these moments to create a necessary and timely conversation with America, not solely Black America, but all people of conscience who "sing America." Racial Realities and Post-Racial Dreams is a harkening and quickening of the spirit, a demand for recognition for those whose voices are whispered. The moral arc does, as a great man once said, bend towards justice, but, as we’ve seen so many times, this arc is frustratingly obtuse when we lose our drive to make things better. Sheri: Who is the intended audience for this book? Dr. Bailey: This is certainly my first general-readership book after three academic-based projects. As such I want people of moral conscience to take hold of this project. Further, I am hoping that many who seek to understand how Racial Matters can be seen through the eyes of people of color without pigeon-holing or name calling but a kindred sense of human value. I have had so much support, within these first four months, by churches, book clubs, college professors, and journalists. Sheri: In an interview with Marc Maron, President Obama said regarding racism, “We are not cured of it.” What is the reality of racism in America and the world in these current times? Dr. Bailey: I think, as I say in the book, President Obama himself talked about exactly this during a 2012 press conference, held in the wake of the George Zimmerman verdict. He said, "that as difficult and challenging as this whole episode has been for a lot of people, he doesn't want us to lose sight that things are getting better." I do agree with him that each successive generation seems to be making progress in changing attitudes when it comes to race. From inter-racial marriages and children to the growing sports culture and of course music, our youth are seeing each other in living color, from K-12 through college so this has to be seen as a plus. President Obama also said, "When I talk to Malia and Sasha and I listen to their friends and I see them interact, they're better than we are. They're better than we were on these issues. And that's true in every community that I've visited all across the country." But what is also true is that America sees itself as better than it really is on many issues but especially on Race. Whether it is on college campuses like mine, grocery stores, and malls, or churches/temples/mosques around our nation, folk often want to fashion America as Post-Racial even when the truth slaps us in the face. Growing Xenophobia, a Racially-skewed criminal justice system that sees people of color as predators and criminals before even being human all contribute to this. Sheri: Sadly, racism is still an issue. What is the biggest contributor to the continuation of this insanity? Dr. Bailey: I think it is ignoring the truth of our biases, the levels of complicity that many of us have in perpetuating stereotypes and how this results in further, if not exponentially more instances of violence against people of color. Take for instance Mayor de Blasio from New York. He said at a press conference on December 7th, 2014 that he (like so many other black or Latino parents) had sat his biracial son down for serious talks about what precautions he needs to take when he deals with New York's finest. He ruffled yet more feathers when he said what few politicians are willing to state outright: "It's different for a white child," he said. "That's just the reality in this country.” This is just honest parenting, the plain truth. No more than a parent saying, “look both ways before crossing the street” or “walk in 2s or 3s when going down streets or college campuses”. But no!! The head of the city's police union claimed that he and his fellow officers were being thrown under the bus" while ignoring the fact that the truth is what the mayor was giving voice to. Michael Brown (Ferguson, MO) and Eric Garner (New York) and the public outcry that is still ongoing in their names have, if nothing else, made the conversation about racial profiling a widely participated in national one. I think because he is white, Mayor de Blasio’s words reached white Americans in a way that might not have been possible had he been African American. There are parallels here between the public outcry that followed the Mayor's condemnation and that that followed the death of James Reeb, the white minister who marched with Martin Luther King in Selma, Alabama, and was clubbed to death by a group of white supremacists. While much of white America was content to stand idly by while African Americans were subject to bigotry and violence, when a white minister got caught up in the fray, his death prompted a national outcry and even a statement from President Lyndon Johnson. The plight of African Americans fighting against police brutality and discrimination in the legal system had until quite recently, fallen upon deaf ears. It took a white man—the mayor of America's most popular city—to bring the issue to the forefront. One can't help but feel that, had he been a dark-skinned man, the waters might have closed over the issue, as they have done for so long, without so much as a ripple. Sheri: Where do you see this reality say 25 years from now? Dr. Bailey: Prayerfully, and with the help of those who truly want to see America at its highest social potential, we can be further along with addressing hypocrisy, confronting bias, promoting equality and ensuring that all Americans, irrespective of race, class, gender, or even sexual orientation can live without the constant threat of its government, and the people who make and uphold these laws, to exact violence (psychic or physical) upon them. I am not calling for utopia but I am calling for civility and compassion amongst lawmakers and police forces alike. But I am sure, whether I am living in my late 60s then or already passed away, that there will be voices of conscience, agitators of agency, lovers of peace at work pushing the demos into its better selves. Sheri: What is it you most hope readers will take away from the message in the book? Dr. Bailey: That to love anything means you need to work at its perfecting, it wholeness, its completion. We are a democratic experiment, still trying to get this thing right after starting behind the moral eight ball of imperialism and slavery. Our development and greatness will depend on our ability to be truthful about ourselves no matter the shame in efforts to be better. Sheri: What are your plans to further convey this message? Dr. Bailey: I will keep on teaching, writing, speaking and praying. I will continue to work with organizations and civic leadership, who would care to collaborate on how to bend the moral arc closer toward justice. Sheri: I understand Racial Realities and Post-Racial Dreams is currently being offered to professors as a resource tool. In what subjects do you see it being taught? What areas of education do you feel would benefit most from this tool? Dr. Bailey: Social Justice, America and Race, Sociology, Theology and Social Philosophy. I have discussed the applicability for English departments to teach this book as a persuasive writing and argument formulation tool. I have found, just using my students as an incubator, that it does help non-students of color to engage in racial questions/issues without judgment and provides space for dissent and contrary voices. Sheri: Who you are as a person, your fundamental beliefs, and core values shine through and define everything you do. As an author, a teacher, and a public speaker, how do you juggle your many hats? Dr. Bailey: I am an American Christian existentialist wrestling through a national habitat that is still defining goodness and truth in function of usefulness. It was this kind of situation that caused Soren Kierkegaard an Existentialist philosopher of the early 19th centuryto contemplate, “I observe nature in order to find God, and I do indeed see omnipotence and wisdom, but I also see much that troubles and disturbs. The summa summarum of this is an objective uncertainty . . .“ As a Catholic education Christian, I was taught through The Bible. And it tells us, “If one part suffers, every part suffers with it; if one part is honored, every part rejoices with it,” but far too often those suffering are left unattended or under-attended and those who are honored rejoice at the expense of those suffering. So, my classes, my public presentations are always meant to disturb the comfortable while also comforting the disturbed. This is as true here, where violence and poverty crush so many of those trapped in our inner cities, as it is abroad, where we kill and maim the guilty and the innocent alike. Sheri: What was your biggest challenge in writing Racial Realities and Post-Racial Dreams? Dr. Bailey: Shifting from Dr. Julius Bailey (professor) to Julius Bailey (writer). As I mentioned, outside of the shorter op-ed pieces I have written for newspapers or music magazines, I am an academic writer (and I Philosopher at that). We tend to speak in an English language that alienates so many. My mom joked to me that this book is the first of the four books that she has been able to get past the Introduction (and she has a college degree). So I think it was clearly finding a voice that was palatable to the masses of people, and yet have those moments of literary flair and philosophical flexing that reminds folk that yes, he isa Howard/Harvard/Univ.of Illinois trained brotha! Sheri: Who is your hero and why? Dr. Bailey: Heroes are dangerous concepts. As a lover of theater, we learn that heroes fall and such is the nature of tragedy. We also tend to use villains as diametrically opposed to heroes and I, as an existentialist I know that ALL OF HUMANITY is wrought by misgivings and ugliness that affects (some more often than others) my ability to be. Remember Jean Paul Sartre’s “Hell is Other People”. So I think I try to shy away from reifying human beings because today’s hero is tomorrow’s villain and vice-versa. Accordingly, I see all those who work and strive for justice, love, and human potential as heroes…until they cease the work of making space for service to others. Sheri: What is the best piece of advice you have ever received? Dr. Bailey: I think it came in 7th-grade mass. A song we sang that I used to sing all the time. It was both catchy and powerful… "Day by day oh dear Lord, three things I pray: To see thee more clearly, Love thee more dearly, Follow thee more nearly, Day by day” That song still resonates to me because as I live my life I know that we all are children of God and how I love humanity must be in line with how I love God. Sheri: What is the best piece of advice you can offer to your students? Dr. Bailey: I often say to them that they need to stop the habit of "getting by." Dr. Cornel West, my mentor calls it "the 11th Commandment…Thou Shalt Not Get Caught". Today's student has so many resources at their disposal that makes hard work and innovative thought more difficult when all they have to do is cheat. That is with relationships, work, school, sports, etc… America tends to reward success but not character, winning but not wisdom. I try to encourage them to be good people first then let the accoutrements of success fall upon them through their good works, deeds, character. Sheri: You are clearly, a busy man! Do you have any downtime, and if so, how do you like to spend it? Dr. Bailey: Busy I am. Honestly, I have learned the importance of sleep. I turn off my phone at 10 or 10:30pm and rest my mind and my body. A year ago I took up Bingo… That is fun when I can play. These jackpots can be kinda big and it gets my mind away from the weight of the world. I am single too, so I try, when I can to get a date. Sheri: What’s next? Is there another book in the works? Dr. Bailey: I want this book to flourish but YES, I am working on three projects within the next year to 18 months. It will be a memoir-like book on my relationships with myself and women; I have been also asked to write something dealing with Why I am a Christian Existentialist, patterned along the lines of both Bertrand Russell’s "Why I am not a Christian" and the great Jewish Theologian, Martin Buber's "I and Though;" and I am in the process of producing and editing another anthology calledHip Hop and Existentialism. Sheri: Do you have a website or a blog (or both), where readers can learn more about Racial Realities and your other works? Dr. Bailey: Yes, www.juliusbailey.com, and from there you can link to the Racial Realities website or just go straight to www.racialrealitiesbook.com. Sheri: Is there anything else you would like to share with our readers today? Dr. Bailey: Just that this has been a quick, yet fascinating set of questions and I thank you for probing me. I do hope that readers find the moral voice in this work. It is not taking a political side or making any legislative calls, I am simply looking at the America that I see and raising a series of questions and observations. I ask the readers to please share their thoughts, frustrations, joys and cries with me via any of my social media accounts, their blogs/reviews of my book or through my website. Sheri: Dr. Bailey, it has been an honor and a pleasure speaking with you today. I thoroughly enjoyed getting to know more about you and your work!